I fell in love with Lauren DeStefano's writing with her Chemical Garden trilogy. I absolutely loved those books, and so I was so excited to read her latest release. And while Perfect Ruin was a good read, a really good read, it just didn't live up to my expectations. 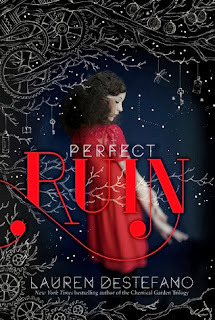 I would have expected less out of any other author, but I expected Perfect Ruin to be a stalker-worthy read, and it just wasn't for me. The premise is unique, and intriguing. I liked the mix of mythology and technology, and even a little bit of magic. The premise reminded me of Beth Revis' Across the Universe series, not in a copying kind of way, but in a set-in-space and trying to escape kind of way. I liked that. As always, DeStefano's imagery was outstanding. I love the way she writes emotion, the characters' feelings just jump off the page, and the emotions in her books are tangible things for me. The characters are young in this book, 15 and 16 years old, and felt a little immature to me. The romance was definitely tame, and just didn't thrill me like her other books. I know I expected too much out of Perfect Ruin. There was a lot of world-building in Perfect Ruin. I think now that the world of Internment has been created and described, book two will be more exciting. The book ended at a high point, and left me anticipating what would happen next. I felt like Perfect Ruin was an emotional thriller as opposed to an action-packed read. I liked Perfect Ruin, but didn't love it. The intensity just wasn't there for me. It was a good read, but not an all-consuming, can't-put-it-down kind of book. I will most definitely read book two, and look forward to it. But, I'm going to lower my expectations a little, so hopefully I'll enjoy this series on its own merit, not continually hoping for a repeat of the Chemical Garden Trilogy.